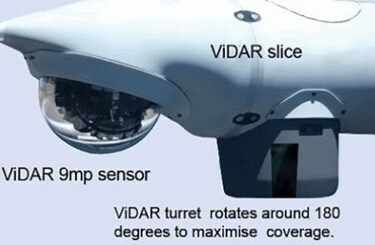 Developed by Australian company Sentient Vision Systems, ViDAR consists of single or multiple 9-megapixel secondary sensor(s) that operate akin to an airborne radar — a high-resolution digital camera continuously scans the ocean in an 180-degree arc, and onboard automation software is designed to automatically detect objects on the ocean in real time. In September last year, Sentient conducted a live demonstration of ViDAR for the U.S. Coast Guard off Cape Cod, MA, where ViDAR successfully detected a fast boat at 17.7 nm, a life raft at 3.7 nm, a person in the water at 1.9 nm, and a shipping vessel at over 33 nm. ViDAR's onboard sensors accurately detected objects in the water in real time, and provided ground control operators with an image and coordinate of each object found. Operators typically rely on larger, more expensive aircraft to detect objects in the ocean during surveillance and search-and-rescue operations. ViDAR expands the utility of tactical UAVs like the NATO-compliant SKELDAR V-200 by enabling them to conduct wide area search to over 80 times the ocean’s surface compared with existing electro-optic sensors. Further, ViDAR adds a ‘find’ function to UAVs for the first time, where sensors can hone in on a particular detected object for a closer classification/identification, is so desired, according to Sentient. “ViDAR proved during demonstrations to both the US Coast Guard and to the Royal Navy in late 2016 just how much of a game-changing technology it can be for finding small objects over wide areas of the open ocean – transforming maritime domain awareness” said Simon Olsen, Sentient’s Director of Business Development, Strategy and Partnerships. “As we develop our maritime customer base, ViDAR is complementary to our on-board and payload capabilities, and will play an important role in developing our footprint for both ISR (intelligence, surveillance and reconnaissance) and SAR (search-and-rescue) operations,” said David Willems, UMS SKELDAR Head of Business Development. Last month, Sentient demonstrated ViDAR to representatives of the European Maritime Safety Agency (EMSA), European Border and Coast Guard Agency (Frontex), and European Fisheries Control Agency (EFCA) during a live trial at Huelva, Spain. During the demonstration, a ViDAR-equipped Insitu ScanEagle RPAS accurately detected vessels, fishing buoys, rafts, and people in the water, reported UAS News. The European maritime agencies plan to install ViDAR in Remotely Piloted Aircraft Systems (RAPS) to turn them into wide-area surveillance assets to monitoring illegal fishing and drug-trafficking activities, enforce border control, and conduct search-and-rescue operations.